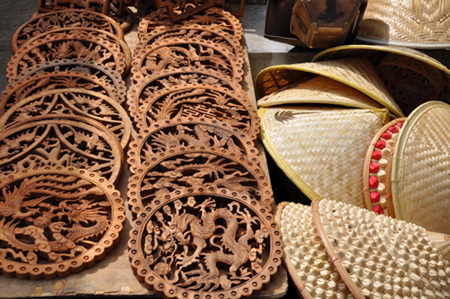 A great tour for travellers arriving from Yunnan Province wishing to explore spectacular scenery and the many ethnic minority villages & cultures of rural China.. The best route to arrive at Xingyi City is from the Yunnan Province. 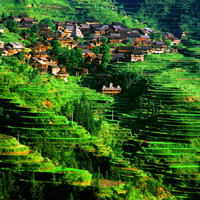 Therefore we can also arrange a pre tour of scenic Yunnan to suit your exact requirements. Arrive in Xingyi before lunch and meet our guide and driver. We will then drive to see the natural scenic beauty of Ten Thousand Peaks national Park, which covers an area of 2,000 square kilometres and is one of the best examples of Karst topography in China, and as its name suggest thousands of strange shaped mountain peaks make for a magical landscape. 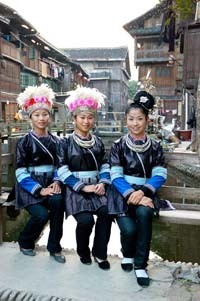 On the way to the Ten Thousand Peaks national Park we will visit the Ethnic Minority Wedding Culture Museum. The museum is a great place to understand more about the costumes and cultures of the ethnic minority people that live in this rural province. Stay at the Xingyi Panjiang Hotel (VIP Building). In the morning we visit the impressive Maling Gorge, located about 10km from Xingyi. 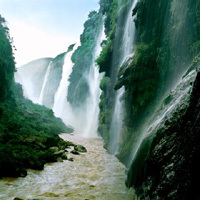 The vast gorge is a deep rift in the Yunnan-Guizhou Plateau which divides the dense forest. At its narrowest, the gorge is only 50m wide and has an depth between 200 to 400 metres. On both sides of the gorge, numerous spectacular permanent & seasonal waterfalls cascade down the steep sides into the roaring Maling river below. The gorge is truly a spectacular scenic location. Afterwards we drive to Huangguoshu (approx 3 hours). Stay at the Huangguoshu Hotel (3-star). This morning we take a short drive to the spectacular Huangguoshu waterfall, which is the largest waterfall in Asia and mystical home to the Monkey King. The stunning Huangguoshu waterfall is 74m high and 81m wide and is where the mighty Baihe River pours into the Rhinoceros Pool below. A highlight is to walk behind the falls through Water Curtain Cave for an unique view of the falls from behind. A few miles down river from the Huangguoshu Waterfall lies the scenic stone forest area located near Heavenly Star Bridge. Star bridge was formed by a large slab of stone which forms a natural bridge across the steep gorge below. We will walk along winding paths and enjoy the beauty of this scenic area, which has stunning views reminiscent of the natural landscape of the 'Dinosaur roaming' Jurassic period. 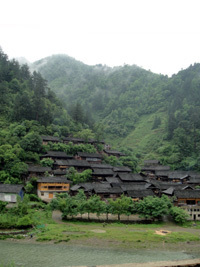 Later we drive to Guiyang and on the way visit the ancient town of Yunfeng. Yunfeng was founded by an outpost of Ming-dynasty troops, who were originally sent from Nanjing to this remote outpost to keep order and fight against rebellions for the Emperor. Entering the town is like stepping back in time, as it is built almost entirely in stone in the traditional Han style. Even the local residents still wear the traditional Han style costumes and maintain ancient tradition not found elsewhere in modern china. 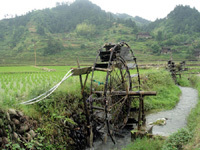 Today we take a scenic and leisurely drive (approx 2.5h) through the mountainous countryside of Guizhou enjoying views of rice paddies terraced into the mountain sides, on our way to visit remote Miao ethnic minority villages. The friendly Mao people are mainly mountain dwellers and their homes are tightly packed wooden structures built on stilts, with balustrades. Your Accommodation for this tour: Carefully selected good hotels & guesthouse accommodations equivalent to 4 and 3 stars. In some remote areas the standard can be lower but we will provide you with one of the best available in the area.